What is developmentally appropriate practice? Does Creative Curriculum use these practices? In the past 75 years, research has provided a great deal of information about childhood as a separate and distinct stage of life with its own characteristics. The application of this body of knowledge to teaching is called developmentally appropriate practice. Developmentally appropriate practice provides children with opportunities to learn and practice newly acquired skills. It offers the context of a community where children are safe and valued, where their physical needs are met, and where they feel psychologically secure. 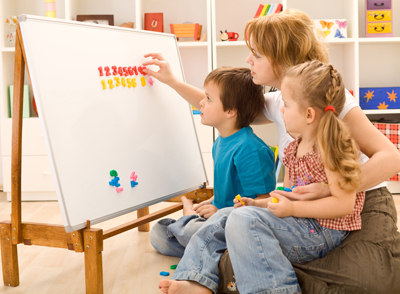 Developmentally appropriate practice means teaching in ways that match the way children develop and learn as set forth by the National Association for the Education of Young Children. The Creative Curriculum Module shows you how to implement developmentally appropriate practices in your classroom. Creative Curriculum highlights the important balance between applying a general knowledge of child development with the particular knowledge a teacher gains by forming a relationship with each child and family. Creative Curriculum describes each subject area and shows how to teach it in ways that support children's academic progress while respecting the way they grow and develop. Creative Curriculum encourages children to experiment, explore, and pursue their own interests. Go Kids is committed to providing quality and excellence. We believe that your child through creative curriculum principles will be able to develop the necessary skills needed to successfully transition into kindergarten. Conscious Discipline integrates classroom management and social-emotional learning. It uses everyday events rather than an external curriculum, and adresses the adult's emotional intelligence as well as the child's Learn to respond to daily conflict in a way that transforms it into an opportunity to teach critical life skills. 1-2-3 Magic is the leading resource for parenting and teaching soulutions that are easy-to-learn and proven to work. Developed by Dr. Thomas Phelan, 1-2-3 Magic helps teachers and parents build strong, positive relationships with their children. This Early Childhood Education website is intended to provide schools, districts, and other interested parties with comprehensive guidance and supporting resources currently available in North Dakota. Below are the North Dakota Pre-Kindergarten Content Standards for four to five year olds.